Quick and easy! 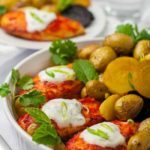 Juicy boneless chicken breasts baked with spicy harissa paste and roasted vegetables are topped with a dollop of yogurt with mint. This North African dish has a beautifully balanced flavours. This Harissa Chicken Sheet Pan Supper celebrates the flavours of North Africa! 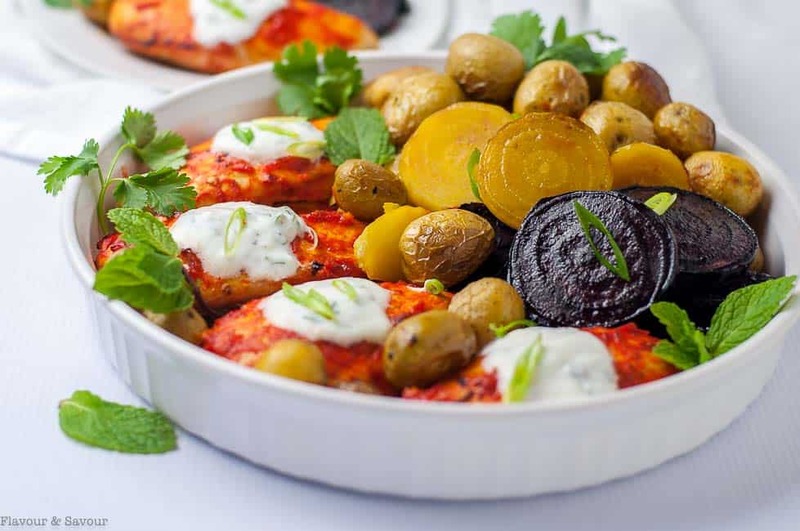 Spicy chicken breasts and roasted baby potatoes, beets and kohlrabi are topped with dollops of yogurt and mint. It’s an easy dinner, all baked in on one sheet pan. Harissa is a red chile paste common in North Africa, and especially Tunisia. It’s made with hot red chili peppers (sometimes smoked), red bell peppers, garlic, olive oil and spices. Read more about it here. Don’t be turned off by its intense bright colour! It’s not as spicy as it looks. However, if you buy store-bought harissa paste (as I did for this recipe) you can choose either regular or mild, depending on your tastes. Harissa paste or spice mix is usually available in the spice aisle or the international food section of your supermarket. I have become obsessed with creating sheet pan dinners. They’re so quick and easy and there’s only one pan to clean. I’ve made sheet pan suppers (also known as tray bake dinners) using fish, as in this Thai Chili Sheet Pan Salmon and Maple-Walnut Crusted Sheet Pan Halibut and with chicken, too. My most popular sheet pan chicken supper is this Sheet Pan Chicken with Roasted Harvest Vegetables, followed very closely by Hoisin Orange Chicken Sheet Pan Dinner with Sweet Potatoes. Clearly, my readers love these easy one-pan meals too! 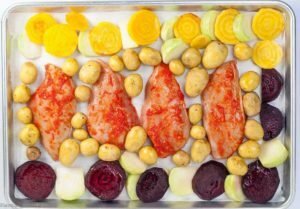 For this Harissa Chicken Sheet Pan Supper I chose boneless, skinless chicken breasts, baby potatoes, red and golden beets and kohlrabi. Kohlrabi isn’t a vegetable I use often, but it has an ever-so-slightly sweet taste when roasted. Along with naturally sweet beets, it balanced the flavours beautifully in this meal. Using vibrantly coloured vegetables and topping each breast with a dollop of yogurt and mint gave this dinner a true Moroccan feel! I added more flavour to the finished dish with chopped green onions and cilantro. 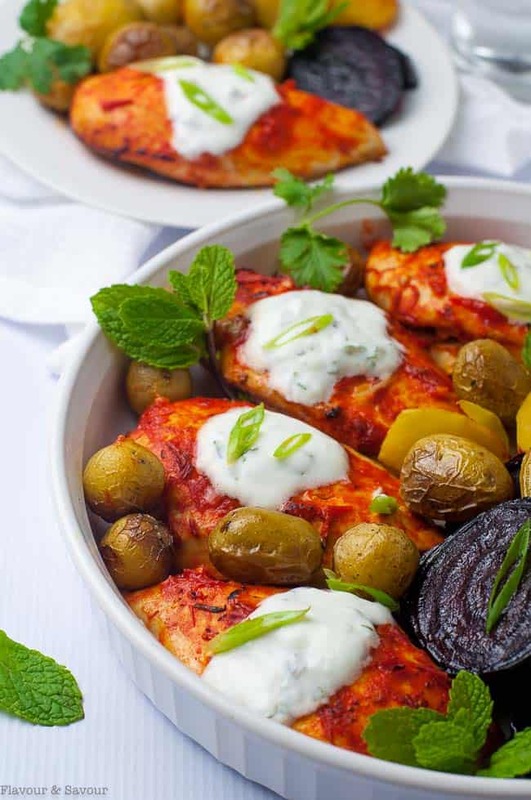 This Harissa Chicken Sheet Pan Supper celebrates the flavours of North Africa! 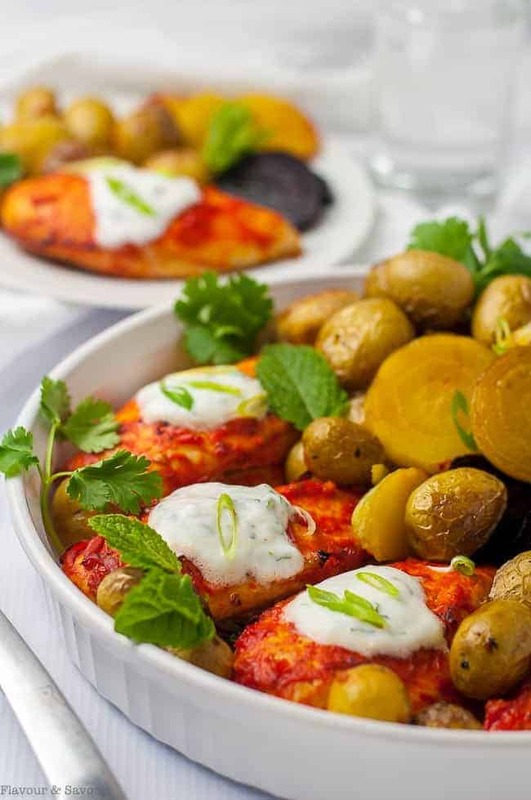 Spicy chicken breasts and roasted vegetables topped with dollops of yogurt and mint. It's an easy dinner, all baked in on one sheet pan. Put chicken breasts in a ziploc bag, add 2 tablespoons of the harissa paste, seal the bag and massage until well coated. Refrigerate for an hour or more to allow chicken to marinate. Line a sheet pan with parchment paper and preheat oven to 400°F. Toss potatoes with 1 1/2 teaspoon olive oil, Toss golden beets and kohlrabi and toss red beets separately with remaining olive oil. Sprinkle with salt and pepper. Arrange marinated chicken on sheet pan and surround with vegetables. Bake for 20 - 25 minutes or until beets and potatoes are fork tender and chicken is no longer pink inside and registers an internal temperature of 170°F. Baste chicken with additional harissa and return to oven for 1 minute. Remove from oven and garnish with a dollop of yogurt, sliced green onions, fresh cilantro and mint. Transfer to a serving platter if you want and serve immediately. Like this recipe? Don’t forget to pin it! Subscribe to my weekly newsletter and never miss a recipe. I can’t find harissa where I live. I will have to look for it next trip to the city. My niece and nephew would absolutely LOVE this recipe. Your photos have me drooling! I’ve never had kohlrabi, but have been looking for the perfect recipe to try it out! As soon as I read “sheet pan” and “harissa” it was clear that this is it! Can’t wait to try this. Kohlrabi isn’t a vegetable I use often, but it’s good both cooked and raw. I combined it with apple in this Kohlrabi Winter Salad and added it to this crustless quiche, too. Hope you get a chance to try it! I don’t use kohlrabi much, either, but I must try it. Thank you for another fabulous sheet pan recipe! Clearly I can see why your sheet pan dinners are so popular! I love them too. And this one sounds amazing. I have never tried Harissa, surprisingly, because I love all the things in it! I will be giving this one a try! I don’t use harissa often, but whenever I do, I wonder why I don’t! Hope you get a chance to try it soon.